Shovel Knight's artwork from Shovel Knight. 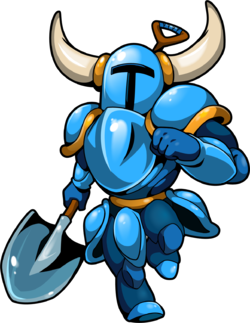 Shovel Knight (ショべルナイト, Shovel Knight) is the protagonist of Yacht Club Games' indie title, Shovel Knight. He is clad in a blue suit of armor and carries a big blue shovel. In the intro to Shovel Knight: Shovel of Hope, Shovel Knight is introduced as an adventurer who worked well with his partner, Shield Knight. On one of the pairs' adventures, they ventured into the Tower of Fate, where a cursed amulet unleashed an evil power, causing Shovel Knight to get knocked out. When he awoke, the tower was sealed, and Shield Knight was nowhere to be seen. This caused Shovel Knight to lose his spirit of adventure, and enter a life of solitude. During this time, the Enchantress rose to power, and had a legion of enemies referred to as the Order of No Quarter under her command. The tower became unsealed, and Shovel Knight left his life of solitude to return peace to the world. Shovel Knight digging on Smashville. Shovel Knight appears as an Assist Trophy. He digs the ground using his shovel, sometimes pulling up items, and can also dig opponents or fling dirt at them. He also uses his Shovel Drop ability to hop on opponents. Shovel Knight as an Assist Trophy in Ultimate. Shovel Knight with Villager, Falco, and Wii Fit Trainer. Shovel Knight digging up food on Find Mii. Shovel Knight is the first Assist Trophy to come from an independent developer. He is also the only third-party Assist Trophy whose company, Yacht Club Games, is not represented with a playable character. Shovel Knight is the second character to appear in Smash that originates from an independent developer, the first being Commander Video. Funnily enough, the two characters appear alongside each other in Indie Pogo. In the Nintendo Direct that revealed Shovel Knight, he digs up a turkey. This is a reference to his own game, in which he can dig up dirt piles to sometimes find gems and food. Also, eating a turkey completely restores Shovel Knight's health. Ultimate is Shovel Knight's third appearance in 3D, after his cameo in fellow indie titles Yooka-Laylee and Runner3. Shovel Knight is the first major character in Smash, playable or not, to appear in other platform fighting games: Rivals of Aether and Brawlhalla as a guest character, and one of many indie characters in Indie Pogo. Link's down aerial attack, the downward thrust from Zelda II: The Adventure of Link, serves as one of the inspirations for Shovel Knight's Shovel Drop attack, which they both use in Smash. This page was last edited on March 14, 2019, at 20:48.